Congratulations again to President Elect Nominee Dana Goba. She is also about to graduate and close on a new home. We’re putting together a relief effort for people affected by Hurricane Sandy. 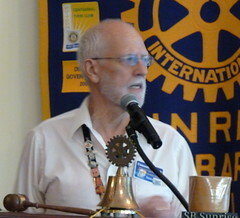 STEPS at UC Santa Barbara on Jan. 26: See the schedule and register (free) at www.rotarystepsonpoverty.org . Lunch will be available for purchase. Rotary Foundation Gala at Holiday Inn Goleta on Jan. 25. Our club is part of the host area, and as hosts, we need to support it with two sgt at arms for the gala. Sandy Grasso-Boyd and Graham Guess volunteered to be sgt at arms. The RI Convention will be in Lisbon, Portugal, in June 2013. $265 registration rate until Dec. 15. Then the price goes up. Don Bennett reported on Salvation Army Bell Ringing. $510 raised. Three more Saturdays to go. There are a few open spots still. “Maybe NOT passing [the signup sheet] around didn’t work.” Please see the sign up sheet. The club holiday party is Dec. 15. If you have not RSVPd, please do. Julie Joy Stilwell requested volunteer bartenders, and she got some. Thanks again to Ed Fleming for hosting the venue. Fred Gaeden volunteered to deliver dictionaries at Adams School, and they want them tomorrow at 8:30 am. Scott Burns will help. Jody Dolan Holehouse, Janet Napier and Karin Napel reminded people to complete their pledges and payments to The Rotary Foundation and The RC of SB Sunrise Foundation. Walt Stephens announced that you can still go see the Rotary Rose Parade float. You can go down on judging day and help with the final flower misting, sweeping and seeing the judging. $35 each for up to 25 people includes transportation, lunch, wine and beer. Julie Joy Stilwell thanked Sherrie Fisher for hosting the dictionary assembly project. She requested volunteers to deliver to Peabody. Scott Johnson and Amy Clemens volunteered. On Dec 19, the Kule club will perform. We’ll also have members share holiday stories and collect food for Unity Shoppe. Tacky, festive, fun holiday clothes and accessories are welcome. Rendezvous at Cafe Stella tomorrow. Luz Maria Ortiz-Smith won the raffle. 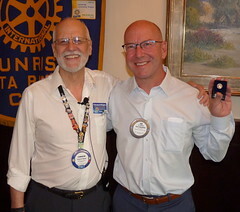 Next year begins the new grant process for Rotary. Why change: streamline, more impact, simplified. There will be 3 kinds of grants instead of 12. District – short term, local or intl. Similar to old, but with electronic submission in advance. Areas of focus: peace and conflict resolution, disease prevention and treatment, economic and community development, water and sanitation, basic education and literacy, maternal and child health. Minimum award of $15,000 from TRF. Clubs and districts must match, resulting in a minimum $36,000 project. Our club’s international committee developed criteria for a project site. Committee chose Nicaragua. There are established connections with RC of Ventura East. They formed an NGO called GOCare. It’s one of the poorest countries in Central America. Five club members went to Nicaragua. They selected the communities of Trinidad Central and Cuajachillo, near Managua. A Rotary Club is being chartered in the affected community. Needs include water, clinic upgrades and education. 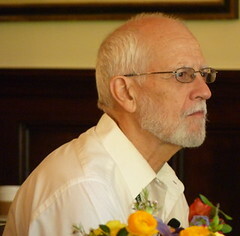 Tom Heath and Bill Ringer shared a slide show and stories from their trip. The water well is 4 hours away. 13 kilometers away on one-lane dirt roads. Water is 300 feet deep below volcanic rock. The people in the communities they picked are ready to participate. The medical clinic does not have electricity. People steal power when there’s a line near them. Sandy Grasso-Boyd shared what’s next. We have to evaluate the feasibility, complete due diligence and sign a memorandum of understanding. We need to send professionals back to the community to assess needs and develop a plan. They ask club members to volunteer their expertise. They also ask club members to help with broader funding. We have to spend money upfront to be sure the project is viable. For example, travel is about $1,000 per person.